It’s a lot of shooting and some significant counter-charge punchiness. He doesn’t have the fully tooled up Raptor Prince, but that brick of raptor knights hits harder than any one unit in my army. I was more mobile than him, so I planned to push up hard and hit his flanks. The Ryma Knights could take opportunistic charges and try to break up his lines while I tried to break through to the soft underbelly of auxiliaries. We had refused flank and capture the flags. His Auxiliaries would prove an Achilles heel in this scenario as I believe he typically uses them as chaff of last resort and doesn’t expect them to live through most battles. We alternated drops for some time until he dropped the raptor unit then I dropped everything for a +4 to go first and won it. …as much as she took satisfaction from thwarting the plots and schemes of their dread cousins, Evana had grown weary of seeing their dark pennants fluttering on the horizon. Having been driven back by the last group of dread elves at the border of their colony Evana had chosen another border crossing at a more isolated corner of the territory. This location had not been her first choice as it was defended by an established garrison from the nearby fortress, as her forces marched forward she could see the well established defensive lines the disciplined dark-armored warriors had set up. There was nothing for it, she needed to break through somewhere and at least this force did not benefit from the strong magical support of the cult priestesses and their acolytes. 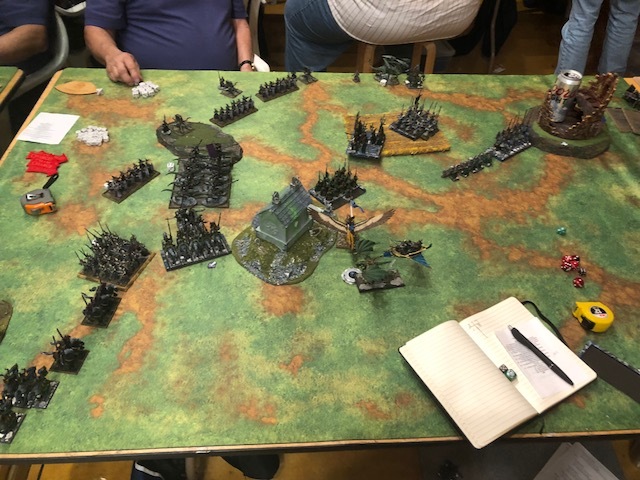 Knowing their mobility was their key advantage her forces stormed forward taking advantage of the crypt hill to their left to break the dread elves force’s ability to cover their angles of assault. Even as they prepared for the charge the first volley of defensive fire whistled out, picking a small handful of infantry off. Evana gave a small smile, her cousin’s healing magics easily repaired the ranged damage from arrows, small blessings…the crack-crack of two bolt throwers releasing their deadly payload drew her her head around. …As Nellenor gave an ear-shattering roar she folded her wings and stooped into a dive, their target, the oracle’s bodyguard of auxiliaries had nowhere to run and braced themselves. As she drew her sword she heard the same ominous crack-crack again and whirled the words of her race’s hereditary protective magic spilling from her lips. Even as she felt the tingling embrace of the spell envelope her, the alarm which tightened her chest a moment ago changed to relief. The damned raptor unit had survived a flank charge from a unit of her household cavalry and had been enveloped by one of the units of her marines and had yet survived with one lone raptor knight and the two lordlings. Having just fought free of the remains of her troops the leaders of the garrison had turned to smash into the flank of her cousin’s bodyguard of Wardens…and that had been where their fight had ended. The two dread lords lay where they had been spitted, transfixed together by a single bolt with the signature royal blue fletching of the Sea Dragon Host. 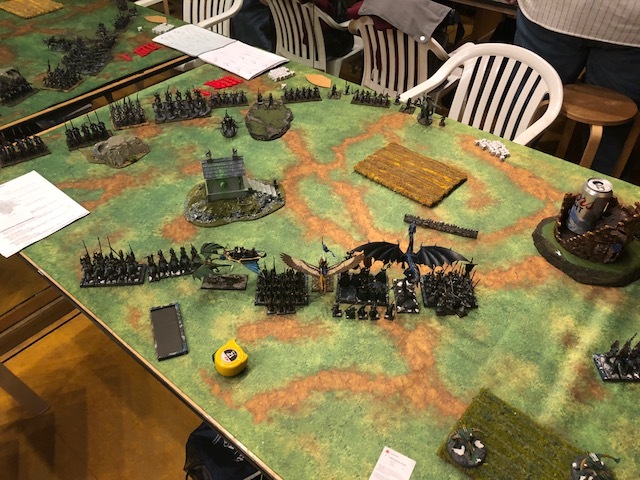 The early game was mixed, losing the frosty to single bolts on the bottom of one was a real impediment, with him alive I’m into the fire base one turn earlier on my right flank. However, my opponent gave me a charge into his raptor chariot with easy overrun into the flank of the raptor star with my Ryma Knights on the left flank, things were looking up. My Ryma Knights blew through the raptor chariot and with know thy enemy up hit the flank of the raptor star. 10 attacks 2s, 2s and a 5+ save did 2 wounds…should have done 6. He sticks, I throw my spears into his front with rending and strength buff up, just do a couple wounds…Ultimately this raptor unit grinds out both the Ryma Knights and sends the spears fleeing with 3 models left. In the bottom of 5 as his raptor knights were freed up, he turned to flank charge my Warden block who were engaged in the front with a hydra. In my top of 6 my SGRs both hit, both wound and manage to kill the last raptor knight and both characters netting me a huge swing in points at the end of the game. I also managed to grab the hydra, oracle and the last bolt throwers and giving me a big 18-2 win. Joe was a cagey player but made a few mistakes that cost him big, he is relatively new as well, looking forward to strong showings in the future Joe! Been a crazy time at work my friend, but I’m off for a couple weeks, I already have the notes from the rest of this tourney and the US masters so you should get hit with some crazy battle reportage in the next week or so. Buckle up!